Apple is the leading on the USA smartphone market. comScore MobiLens and Mobile Metrix has analized the data concerning the situation on the smartphone market in the USA for January 2014. It turns out that Apple is on the rise, constantly increasing it share, while Android is falling behind. Blackberry lost the third place to Windows Phone. Check out these charts that visualize the rise and fall of key players in the smartphone market since 2005. The data is from comScore's 2013 Mobile Future in Focus whitepaper. While Android and iOS might appear poised to lock up the smartphone market for good, it is worth looking at the history of the smartphone market to understand just how quickly fortunes can change. In 2005, the market was dominated by Palm, Symbian and BlackBerry. However, by the following year all three had ceded control to Microsoft as the new market share leader. 2008-2010 saw BlackBerry stage a comeback to assume the #1 position before eventually giving way to the upstart Android platform in 2011. The only key player in the current smartphone market never to have owned the market share lead, interestingly enough, is iOS. 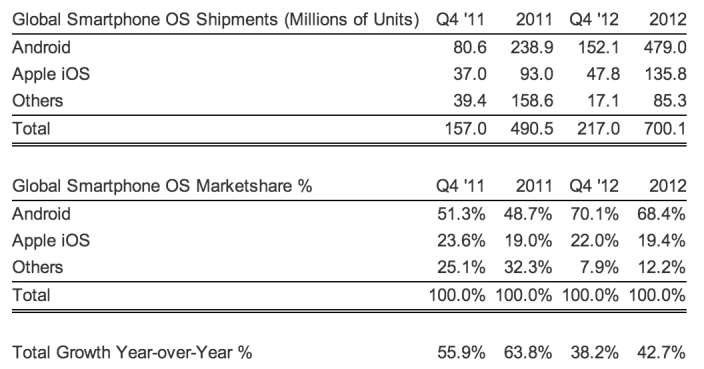 According to the Strategy Analytics’ latest research measuring global smartphone OS shipments for the fourth quarter of 2012, Android and iOS together represented 92% of all shipments. Both operating systems were able to considerably increase their market shares over Q3, with global smartphone shipments over the year reaching a record 700.1 million units. Market research company comScore published their latest estimates of market shares taken by the main players on the mobile market. 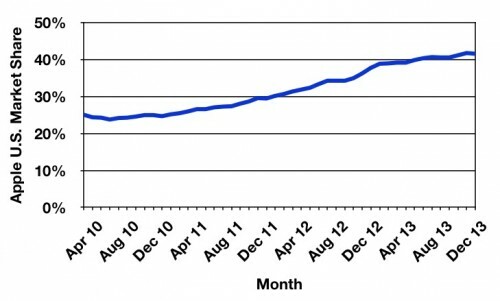 Apple’s share continues to slowly move upward with 11.2 percent of all U.S. Mobile Subscribers. According to the results of worldwide mobile phone sales for the third quarter of 2011, released yesterday by the research firm Gartner, Apple's share of the total mobile phone market came in at 3.9% for the quarter, down from 4.6% in the previous quarter. 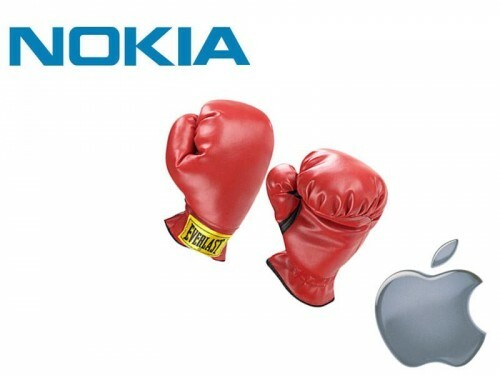 However, Apple still takes fourth place behind Nokia, Samsung, and LG. Apple shipped 17 million iPhones, an annual increase of 21 percent, but down nearly 3 million units from the second quarter of 2011 because of Apple's new device announcement in October. Gartner believes Apple will bounce back in the fourth quarter because of its strongest ever preorders for the iPhone 4S in the first weekend after its announcement. Markets such as Brazil, Mexico, Russia and China are becoming more important to Apple, representing 16 percent of overall sales and showing that the iPhone has a place in emerging markets, especially now that the 3GS and 4 have received price cuts. 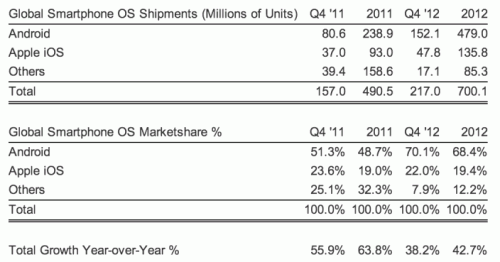 iOS share slipped from an 18.2% in the second quarter to 15.0% in the third quarter. 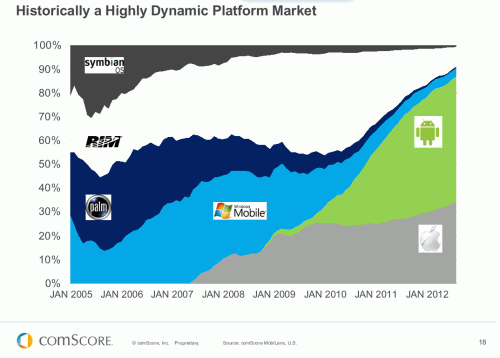 Android and Nokia with its soon-to-be-defunct Symbian platform are now leaders of the market. During the quarter, Android’s share increased by 52.5%, more than doubling year-over-year. 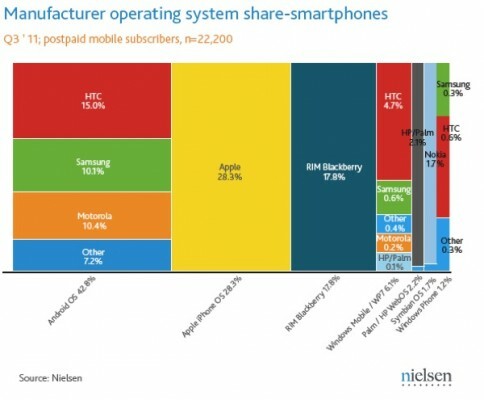 But Android dominates the worldwide smartphone market by units while Apple by profit. Some researches show that Apple now takes more than a half of the industry's profits. What does the Skype sale mean for Apple customers? By now everyone seems to know that Microsoft has acquired online communication giant Skype for a huge 8.5 billion dollars. 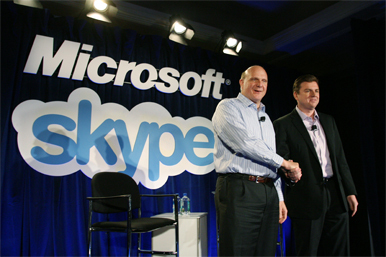 Mac and iOS users immediately questioned the acquisition as a way for Microsoft to turn Skype into an exclusive service for Windows Live-connected devices and other Microsoft products such as the Xbox, Windows 7 and the new Windows Phone 7 OS. Steve Ballmer, however, was quick to reassure everyone that Skype will continue working on the Mac, iOS and all the other platforms it currently runs on (including RIM’s BlackBerry and Symbian). Microsoft, of course, takes Apple as one of the major rivals, though it has a full version of Office 2011 available for Macs, and many apps for iPhones and iPads. The question, however, is whether Skype will ever release a native iPad app as promised last year, and if the new owner will also bring some welcome interface changes to the Mac app. As you may know, today's StatCounter published its fresh report based on web analytics about mobile users. 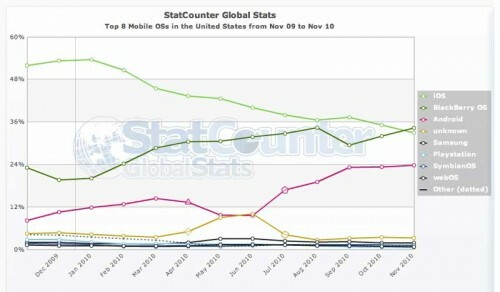 Unfortunately, StatCounter can monitor only web traffic, but not the way the smartphones are being used. However, the results of such research can offer many different data that can be organized in different ways. For example, a vendor of network server monitoring tools Pingdom also took the Statcounter's results but analyzed only mobile OS usage, including the stats for iPod touch (iPad wasn't included). It was found that though the sales of Android-based smartphones have overtaken the sales of the iPhone in the US, such a statement does not take into account the fact that iPod touch is the most popular portable media player, and it is also based on iOS, which makes the latter the most popular mobile OS in the country. Today's StatCounter published its fresh report based on web analytics about mobile users, where it is said that 34.3% of all American users generate web traffic from RIM's smartphones, while 33% browse the Internet with their iPhones. 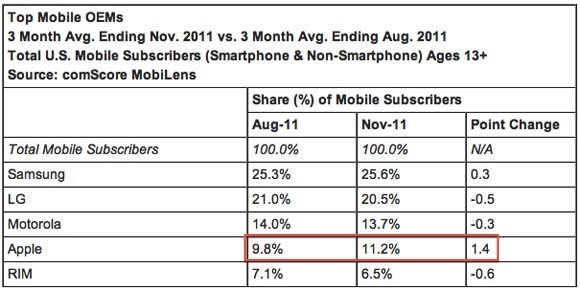 Two years ago Apple beated RIM in this stats, as iPhone users generate three times more traffic than those who have BlackBerry. 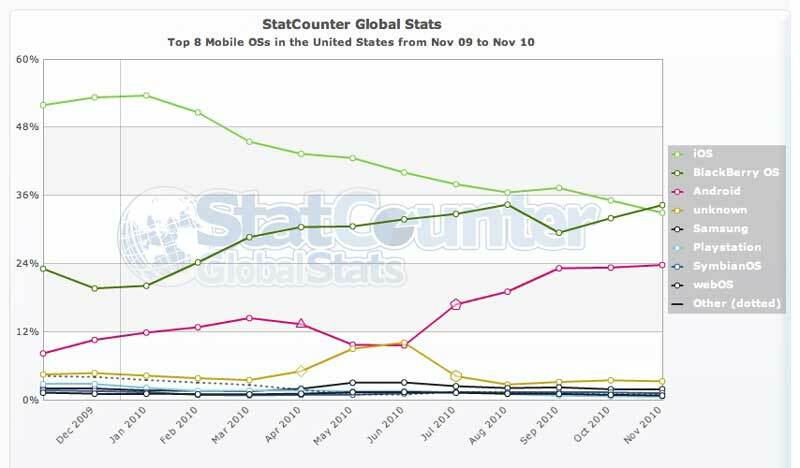 StatCounter reveals that a year ago Apple's iOS had 52.9% share in terms of mobile web usage, so such a drop is pretty huge. To make such conclusion the company analyzed 3 million websites with 15 billion page views per month.